Contemporay seascape using a pallette of soft lemon yellows and blues. Perfect for a beachside interior. Woven on a Jacquard loom with 100% fine cotton yarns. 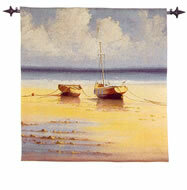 Clean colours highlight this Jacquard loom woven tapestry featuring yachts on the water of a small bay. Woven in 100% natural, fine cottons. The sun is beginning to set on the two boats left moored by the retreating tide. Woven on a Jacquard loom with fine cotton yarns. Perfect to add warmth and texture to a beachside interior. 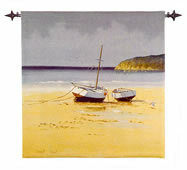 Two boats marooned on the shore by the retreating tide, with the headland in the distance. 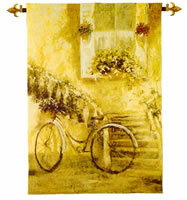 Woven on Jacquard looms with 100% fine cotton yarns. Adding distinction to any beachside interior. 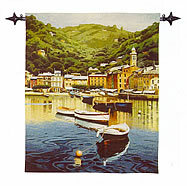 This fine view could be of a harbour in the Mediteranean, or even the Cornish Coast, with the gulls circling overhead.Woven on a Jacquard loom with 100% natural cotton yarns. Early morning on the harbour terraces, cafes ready for the first diners to take in the splendid view. Woven on a Jacquard loom with pure, fine cotton yarns. Pink Tulips in terracotta pots bring a sylish air of warmth and texture to today's interiors.Woven on a Jacquard loom with pure, fine cotton yarns. The beautiful tones of the trees' foliage make this forest trail come alive. Will add warmth and texture to any interior. Woven on a Jacquard loom with pure, natural, fine, cotton yarns. This delightful rural scene set in late Autumn has great charm and wide appeal. Woven on a Jacquard loom with natural cotton yarns. The soft light of an Autumn evening shines on a village. 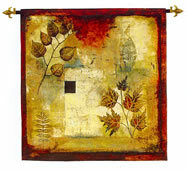 The warmth and texture this tapestry would add to an interior will be memorable to all who view it. 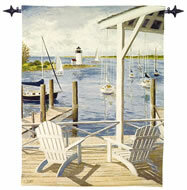 Woven on a Jacquard loom in pure cotton yarns. 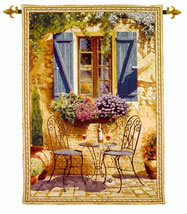 A lovely mediteranean vignette with many elements contributing to this delightful scene. Woven on a Jacquard loom with 100% cotton yarns. 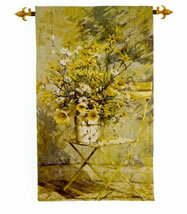 A contemporary floral tapestry with natural style suitable for a cottage interior. Woven on a Jacquard loom with pure cotton yarns. 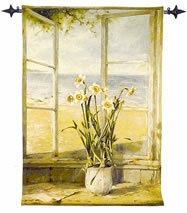 An attractive scene in lovely soft tones give this tapestry a simple charm and a memorable addition to a room. Woven on a Jacquard loom in pure cotton yarns. 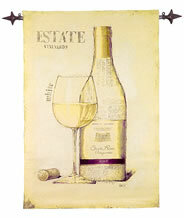 This view over the vineyard, cellars and surrounding landscape to the village on the nearby hill is presented in this tapestry without a border and this gives the design a contemporary flavour. Woven on a jacquard lomm with 100% cotton yarns. 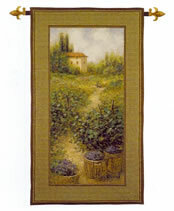 A deep woven border frames this tapestry of an old rustic vineyard with the grapes just picked, sitting in wooden tubs. Woven on a jacquard loom in natural cotton yarns. 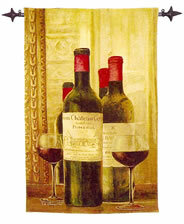 A classic wine still life with rich colours and traditional back drop in the warmth and texture of tapestry. Woven on a Jacquard loom. 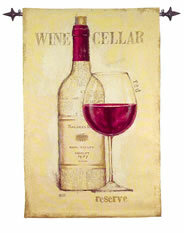 A classic wine tapestry with a contemporary feel. Clean design with the warmth and texture of 100% cotton. Woven on a Jacquard loom.